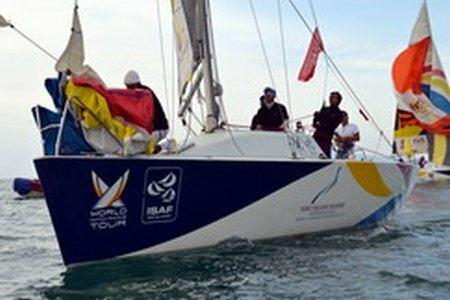 Goto AY Race Report 2Sept 29th – Tg Leman, Johor: Teams participating in match racing are ready to fight it out till the bitter end. Every race starts with a head to head battle and continues until one emerges triumphant. The round robin format is structured for teams to make their way up the pecking order and finish on top of the pile. Each race is a constant challenge and like any competitive sport, the aim at the end of the day is to finish number one. Those just starting out will be encouraged to achieve their dreams and do the best they can to gain experience. These qualities have made match racing exciting to watch and the often fast and furious action over short courses continues to attract interest and participation to survive as a discipline within the sport. With all this cut throat determination there are no ‘Give Me’ races in this field. Yesterday they battled through trying conditions and managed to complete almost half the Qualifying Round Robin matches. The pecking order was established with the top teams from the previous stages taking the top spots. Today in nearly every flight, these teams go head to head with the top four teams advancing to the knock out semi finals and ultimately the grand final. Only a few seconds separates the winner and loser but in this cruel world there is no prize for coming second. After the pre-start jostling the team that gets away clear tries to carry the advantage through the race. That was the situation for Masyuri (RMNMRT 1) when they came up against arch rival Hazwan’s (Permai Hotel MR Team) to claim the victory by 1min 39secs. Malaysian Olympian Nizam (Kedah MR Team) came from behind to beat Rizal (SetiaWest Marine) to win his first race on the circuit and leave Rizal’s crew scratching their heads analyzing what went wrong. Flight 9 turned into the battle of the heavyweights. Haris (RMNMRT 2) versus Masyuri (RMNMRT 1) turned into a procession after Masyuri won the start and led around the course to convincingly earn the victory. The Koo (KFC Malaysia/KRT) versus Hazwan (Permai Hotel MR Team) turned into a feisty affair with Haswan taking the start and leading the way. A mix up at the top mark saw Haswan round the wrong mark and although they crossed the finish line in front they gracefully retired and gifted the win to Koo. Despite a passing rain shower the race committee continued on and were determined to complete the qualifying round robin and get stuck into the quarter finals by the end of the day. The final Flight 11 pitted the two top contenders Koo (KFC Malaysia/KRT) and Masyuri (RMNMRT 1) together. Although the quarter finalists were already decided this match up would determine first and second places in the pecking order. The closest match of the round robin followed with Koo coming out on top by a mere 22 seconds. During the break the wind faded and just when it looked like racing would be abandoned for the day, a line of breeze appeared on the horizon, so it was all hands on deck and straight into the best of three race semi finals. In a surprise move Jeremy Koo chose second placed Masyuri as his opponent, which left third and fourth placed Hazwan and Haris to fight it out in the other semi final. Make one mistake and you will be punished severely. On two occasions just when Haris was looking good they made the wrong call and Hazwan capitalised to seal his place in the final. The Koo versus Masyuri semi final turned into a feisty affair with umpire calls coming thick and fast. Koo dominated the first race but got caught as windward boat in a luffing duel and earned a penalty to make it 1 – 1. That may have rattled them as they hit the start boat on the final race and were out sailed to make it 2 -1 in Masyuri’s favour and a shock defeat to the current overall leader to race for 3rd and 4th places. Racing continues tomorrow with the Petit Final and Final then culminates with a combined presentation and gala dinner with the Sultan of Johor and various dignitaries in attendance.